Remember the good old days when Google was all about find restaurants opening times and a phone number to call and book? Then eventually launching the booking button, so you can book your spot directly in search. While has been hugely popular at helping us stuff our face, Google has taken an 180-degree turn begun to try it out on other avenues, namely fitness. Google now wants to get you into shape, why? Google? Why? While it may not be my cup of tea, I can see the value if provides fitness enthusiasts, especially those who travel or commute. Finding fitness classes class by and being able to book them in real time can be a real time saver and fat burner. 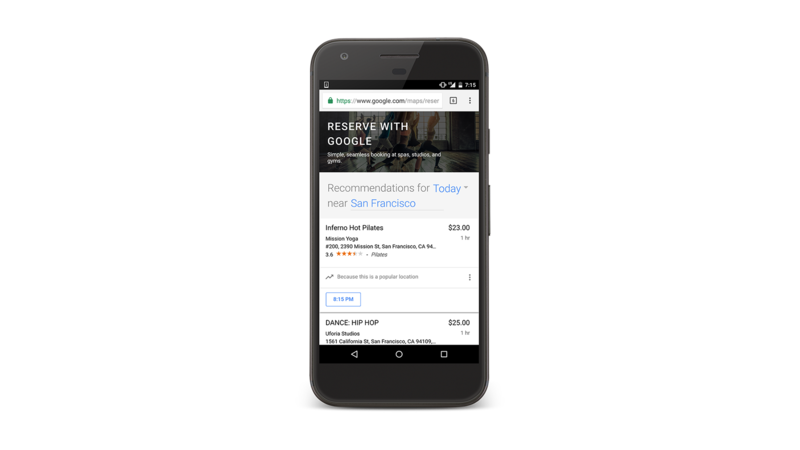 Starting this month Google has rolled out its new product called Reserve with Google. Which allows you to book and pay for fitness classes throughout the U.S. on Google Maps, Google Search and via Reserve with Google website. Here’s how it works: Visit Reserve with Google on desktop or mobile. There you can search for fitness studios near you, use filters to pinpoint exactly what you’re looking for, get recommendations for new classes, or book a spot in the session you already know and love. For local and small business owners, online booking represents a new tool and metric that very concretely demonstrates the value of digital media and marketing. While for consumers, it represents a convenience that may create local winners and losers for those who adopt or refuse to adopt this new method of client booking. Depending on the adoption rate this could change the way vendors attract new clientele as well as making them subservient to “booking enablers,” so they're able to tap into this market. With this increase in visibility of competitors in your local businesses will have to either compete on price or on value ads in order to survive. Google has previously worked with a range of third-party providers to bring online reservations to the Knowledge Graph when looking for hotel accommodation. But now the company has gone much further into online booking with a new program called “Reserve with Google.” which could see it become an API of choice for booking services to tap into from flights, accommodation, restaurants, car hire and more, only time will tell. With Google’s announcement, it would appear that there’s something of a booking arms race now going on as other companies like Yelp are also playing in this space. Businesses and consumers will need to be prepared for change as local search continues to become much more transactional. How do you feel about instant purchasing and booking from search? Do you think it's better for a consumer? Do you think consumers trust Google enough drive this trend? Will it marginalise sites who aren't compliant with third-party booking engines? Let us know what you think in the comments section below.